Triggers/Content Advisory: Fantasy thrills and action/violence. Source: Thank you to the publisher for sending me an eARC of this book in exchange for an honest review as part of the blog tour. After the dramatic events of The Creeping Shadow, the Lockwood team (plus Quill Kipps) deserve some well-earned rest. So naturally they break into the Fittes Mausoleum, on a perilous mission to discover the truth about London's top ghost-hunting agency, and its sinister leader. What they discover will change everything. But there's little time to ponder. A near-miss at a haunted fairground is only the start - as the Fittes agency closes in on the team, an epic struggle commences. With the help of some unexpected, and rather ghostly, allies, Lockwood & Co must battle their greatest enemy yet, as they move ever closer to the moment when the earth-shattering secret of 'the problem' will finally be revealed. This story is wonderful. It's fast-paced, thrilling, unashamedly and fantastically British, with a terrifically spooky atmosphere that always keeps the setting alive and the tone vivid. It's a detective tale, and it glints with ghosts and seethes with specters - giving the reader an escape into an Otherworldly realm of magical illusions and dark secrets. The writing's elegant and skillful. The descriptions are extremely specific and imaginative, but while I do love this, it's also hard to see place sometimes; simply because there're so many details. It isn't boring, but you do have to concentrate to get the full effect. The humour is excellent. The dialogue is rich with wit and subtext, and there are plenty of laugh-out-loud moments. Lockwood didn’t speak until everything was quiet again. “I know you’re worrying about me, Luce,” he said. “But you really mustn’t. These things happen when you’re an agent. You’ve been snared by ghosts in the past, haven’t you? There was the one that made the bloody footprints, and the thing in the tunnels below the Aickmere Brothers store. But it’s fine, because I helped you then, and you’ve helped me now. We’re there to help each other. If we do that, we’ll get through.” Which was a lovely thing to say, and it made me feel a little warmer. I just had to hope it was true. The characters are awesome. I wish they'd gotten a bit more rounding-out (they aren't as vivid as they could be) but they're still fantastic, three dimensional humans with compelling personalities, back stories, and relationships. I love Lucy and how she's such a brave, flawed, unique heroine. I love Lockwood, Holly and George, all for their different traits and complications, and they actually remind me a lot of the Harry Potter characters - just because of the natural, effortless manner and style in which they're written. Even though they aren't extremely vivid, Stroud writes them as if they're real people. And I love that. I also love the emphasis Stroud places on friendship. It makes me love the characters so much more because of the way they interact together and because they're so fiercely protective of each other. And following on from that, I also adore how everyone is equal. The girls and guys are utterly and absolutely equal and there's never any bashing when it comes to capabilities. The characters are written as equals in such a natural way that it makes you wish people could be so accepting in real life. Oh! And there's also the skull. Gosh, I love that guy. He's so sassy, inappropriate, entertaining, and lovable. He's definitely one of my favourite characters. The romance is simple, subtle, and gentle. I ship Lucewood so much, and I adore their slow-burn romance - their enthralling relationship. It's beautifully human and intensely vulnerable. 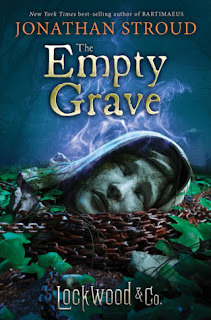 The Empty Grave is a skillful and satisfying conclusion to the Lockwood and Co. series. It's a beautiful, clean story, with a dash of romance, strong friendships, and lovable characters. Overall, a solid, fun tale. After the dramatic events of The Creeping Shadow, the Lockwood team (plus Quill Kipps) deserve some well-earned rest. So naturally they break into the Fittes Mausoleum, on a perilous mission to discover the truth about London's top ghost-hunting agency, and its sinister leader. What they discover will change everything. But there's little time to ponder. A near-miss at a haunted fairground is only the start - as the Fittes agency closes in on the team, an epic struggle commences. With the help of some unexpected, and rather ghostly, allies, Lockwood & Co must battle their greatest enemy yet, as they move ever closer to the moment when the earth-shattering secret of 'the problem' will finally be revealed. Jonathan Stroud once again delivers a rousing adventure full of danger, laughs, twists, and frights. The revelations will send readers back to Book 1 to start the series all over again. Jonathan Anthony Stroud is an author of fantasy books, mainly for children and youths. Stroud grew up in St Albans where he enjoyed reading books, drawing pictures, and writing stories. Between the ages seven and nine he was often ill, so he spent most of his days in the hospital or in his bed at home. To escape boredom he would occupy himself with books and stories. After he completed his studies of English literature at the University of York, he worked in London as an editor for the Walker Books store. He worked with different types of books there and this soon led to the writing of his own books. 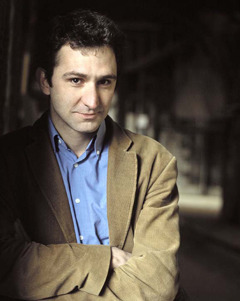 During the 1990s, he started publishing his own works and quickly gained success. In May 1999, Stroud published his first children's novel, Buried Fire, which was the first of a line of fantasy/mythology children's books. Among his most prominent works are the bestselling Bartimaeus Trilogy. A special feature of these novels compared to others of their genre is that Stroud examines the stereotypes and ethics of the magician class and the enslaved demons. This is done by examining the perspective of the sarcastic and slightly egomaniacal djinni Bartimaeus. The books in this series are The Amulet of Samarkand, The Golem's Eye, and Ptolemy's Gate, his first books to be published in the United States. Stroud lives in St Albans, Hertfordshire, with his two children, Isabelle and Arthur, and his wife Gina, an illustrator of children's books. 3 winners will receive a finished copy of THE EMPTY GRAVE, US Only. Are you fantastically spooked for The Empty Grave?! Is it something you'd like to read? Oooh this sounds like such a fun book!! Thank you for the chance to win it! Even if I don't win I'm definitely keeping my eye out for it! "Fantastically British"?! Okay, you have me sold on this! I haven't heard of this series/author before, but I'm definitely intrigued now. The spooky aspect especially stands out to me. Great review, Amy! Hahaha yay! And you really should read it, I think you'll enjoy it.